Buenos Aires is beloved for its nightlife, carnivorous cuisine, and its famous dance, tango. 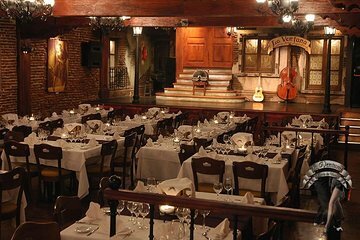 Have a characteristic Buenos Aires night out planned for you with this dinner and tango show in the Aljibe Room, one of the city’s traditional tango nightclubs. After dining on four courses of Argentinean cuisine, watch an hour-long tango and folklore show. Pick up from your hotel not included. you have to stay there at 7 pm. This was a great show, a few pictures after the show would have been good. The dancers were magnificent, so agile and beautiful Ladies. The food was excellent, I would recommend to anyone, go and visit.